Congratulations to Angela Benoit on the purchase of this beautiful filly! Sweet Chickadee DF - Chickadee is a friendly and typey filly. She has a nice head, long neck and strong hip. She has unique markings and has had regular 6-way shots, worming and hoof trims. She is a real sweetie. Chickadee will make a beautiful and flashy show or pleasure horse or broodmare. 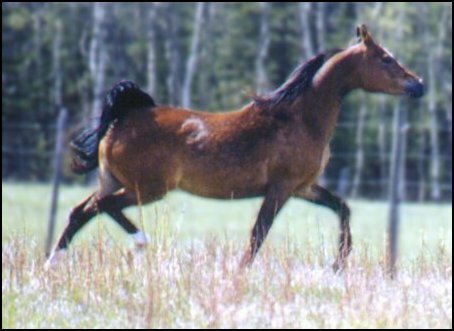 Chickadee is registered with the Canadian Half-Arabian Horse Registry.